Beets are part of the plant family (Amaranthaceae-Chenopodiaceae) and are related to chard – in case you noticed a similarity in the taste and texture of their leaves. 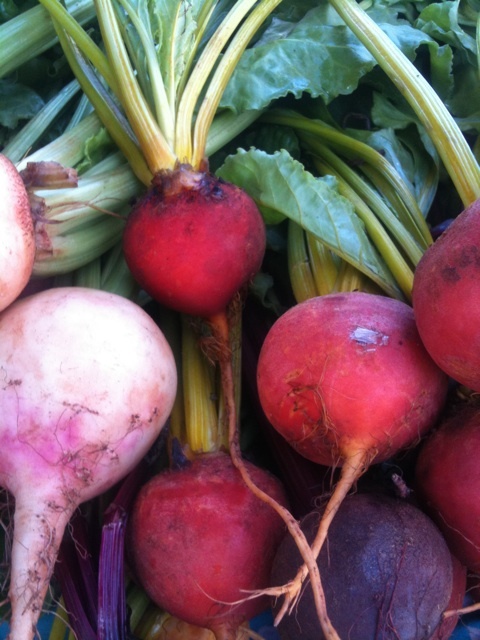 Beets are cultivated for their sweet round or oblong root. 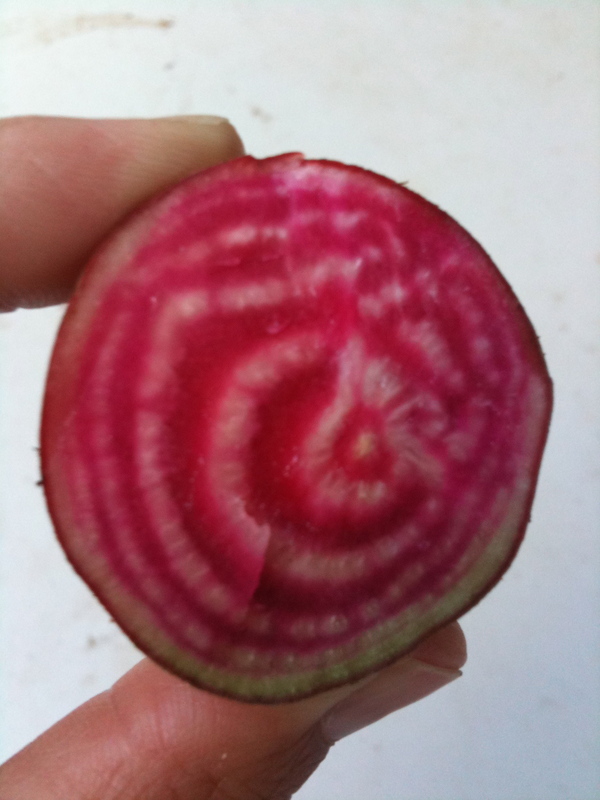 When most people think of beets they think of the very dark and beautiful reddish-purple variety, however beets also come in varieties with roots that are white, golden/yellow or fancy like the chioggia which when sliced displays striking red rings in white flesh. Beets’ sweet taste is a reflection of their high sugar content. 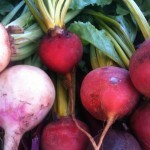 Raw beet roots have a crunchy texture, cooked they turn soft, almost buttery. Beet leaves have an ever so slight bitter taste like chard. Beet greens are a rich source of nutrients, high in vitamins and minerals as well as beta-carotene and lutein/zeaxanthin. – Rinse beets gently under cold running water, careful not to tear the skin, which helps keep all the healthy good stuff inside. – Beet juice can stain your skin, so wear kitchen gloves if you need to. If your hands become stained, rubbing a little fresh lemon juice will take care of it. 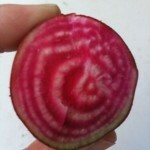 – Beets can be steamed, roasted, baked or pickled. 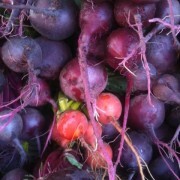 – Smaller, younger beets may be so tender that you may not have to peeling them after they are cooked. – Beet greens can be cooked like spinach or chard. Look for beets that are deep in color, firm, free of wrinkles and soft spots or wet spots. Though beets are pretty firm and hearty looking, they are pretty fragile. Any slight bruise or puncture will cause red beets’ red-purple pigments (which contain a variety of phytonutrients including the valuable betalains and anthocyanins) to bleed and so degrade nutritionally, especially during cooking. Choose smaller, younger beets if you want to avoid peeling them after they are cooked. Buying beets with greens still attached will give you two dishes. Look for greens that are lively in color, fresh and tender. Do not wash beets or stops before storing. To store cut the greens and their stems from the beet roots leaving about two inches to prevent the roots from bleeding. Seperating the greens from the roots prevents the greens from pulling moisture away from the root. Wrap roots tightly in a plastic bag and store in the refrigerator, they will keep up to 3 weeks. Store the unwashed greens in a separate plastic bag, squeezing air out and place in refrigerator, they will keep for up to 4 days. Raw beets do not freeze well, they lose their firmness upon thawing. Cooked beets freeze just fine.